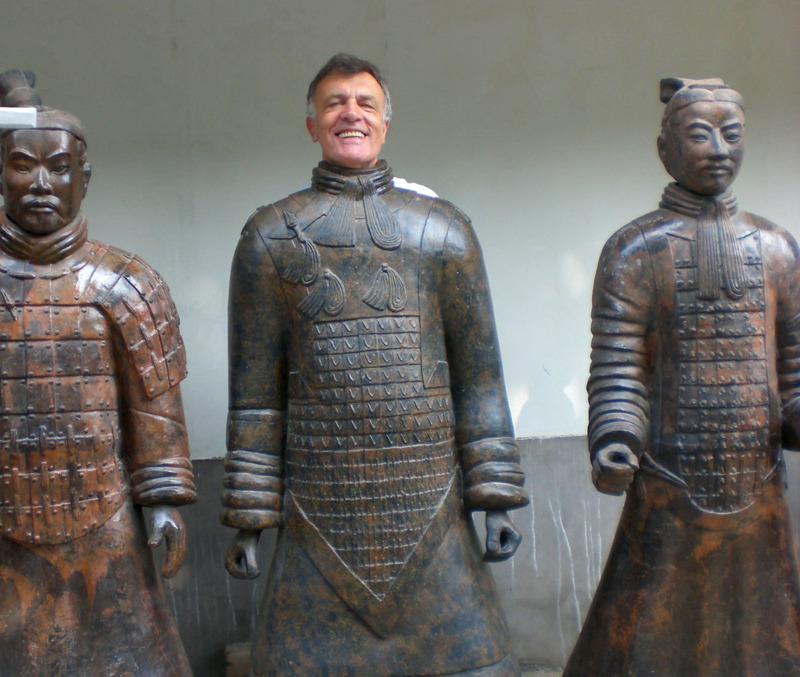 Back in 2011 when my parents visited for their first time China we decided to take a look at the famous Terracotta Army. During the week my parents were in China we tried to see as much as possible around Xi’an. It was certainly not easy as my parents are not the youngest anymore but they tried their best. The excavation site with the museum is located in Lintong District, Xi’an. As we stayed in the city center it took us about 45min by car to get to the famous place. During that day we had staggering +39 degrees celsius ~102 degrees fahrenheit. For unknown reasons we had the whole week already blue sky and hence less smog to protect us from the intensely burning sun. Nearly all of my memories from that trip are actually all about getting from one place with air-condition to the next without spending too much time outside. So much furniture and decoration! After that we finally set out for the terracotta warriors. Even though it was so terrible hot it was still filled with tourists. The hardest part for us was the trip from the car, through the entrance, following the near endless path to the main museum buildings. Though in retrospect the way was perhaps only a 15min walk it still felt like hours. To make matters worse there were several places selling stinky tofu. The heat and the smell was near overkill for me and my parents, my wife actually enjoyed it though. In the end we managed it to reach the main area. As my mind was badly effected by the heat and the stinky tofu I can not tell you anymore the exact layout except that there were several buildings and pits. We visited first the biggest building which was a museum with a collection of the artifacts found in that area. Needless to say it was packed with people and it was hard to take any pictures without any head poking into the camera. The best part for me was of course the fact that the air condition kept me away from the melting point. There were so many rooms to visit in that building that it took us a long time to go through it. In this case a tour guide would have been nice but it was also nice to be more flexible and set our own pace. After watching countless of artifacts we managed to go to Pit 1. There are several Pits in various sizes but Pit 1 is probably most famous as it is just huge and has rows after rows of the terracotta warriors standing guard. I only have a few pictures as I was more concerned on video taping everything with my other camera while trying to survive the heat, yes the heat, as there was no air condition in that huge hall resulting also that we tried to hurry around and be done with it. All in all I can say that visiting the terracotta army is a must when staying for some time in Xi’an but it is certainly not my favorite place. All the information you can get there about the past is certainly great but somehow I just could not enjoy it, it might be also due to the fact that I was near a heat stroke and thus my recollection of that day is messed up. For more information about the Terracotta Army simply check out what Wikipedia as to say about it. Have you visited the Terracotta Army already? What are the places you would love to visit in China? Be sure to follow me also on Facebook and on Twitter as I will post there occasionally pictures which do not find their way into my blog posts. The heat and stinky tofu combination doesn’t sound pleasant on a hot, sunny day. Loved the picture of pit 1 but I can just imagine how crowded it was there. I have to admit that the Terracotta Army is pretty awesome find – I mean the details are just amazing. 39 degrees and stinky tofu is quite the thought. Lol, it’s no wonder your memories of your visit are not that fond. 😉 We had the opposite problem. We visited in the middle of winter, and it was freezing cold, with no heat in the pits. I don’t think that I have ever felt as cold as I did that day!! Indeed it is not the best to visit then it is too hot or too cold. Was it also crowded during winter time? What I heard that it is near maximum capacity nearly every day ! It certainly does sees so. 🙂 Actually when we visited back in 2008, it wasn’t too busy. I’m not sure if it was because of the cold, or because China was not so big of a tourist destination yet, but I feel like it was the latter. It was before the Olympics, and there were not too many tourists around at all… even in Beijing. Mainly I see Chinese tourists here around, I guess they take up 95% of all people at these historical places. 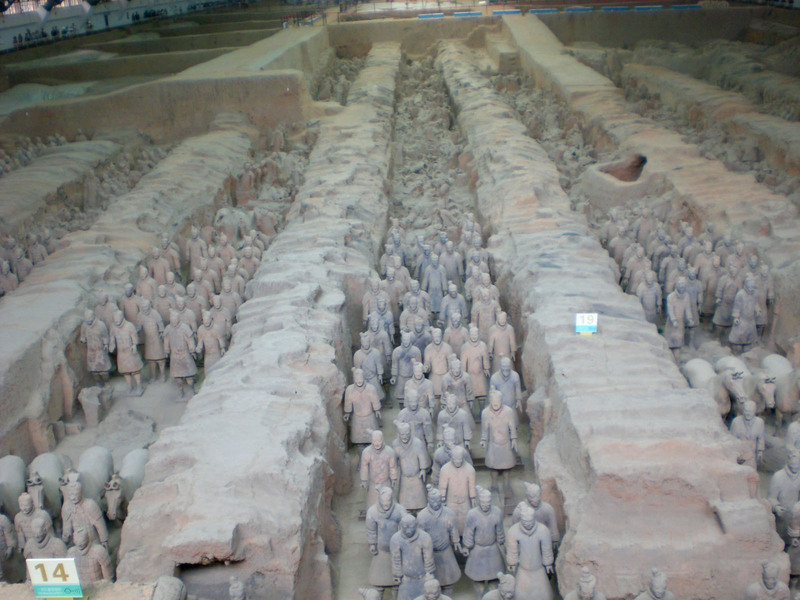 The phenomenon of the Terracotta Army is just amazing. Your pictures give a good overview. It’s hard to enjoy the sights when it’s too hot or too cold. Once my daughters and I visited Madrid in the summer. We tried walking to some points of interest, but the heat made me too tired to appreciate it. I didn’t bother to take more than a handful of photos. I hope that placed allowed people to take in water to keep them cool and prevent them from dehydration. From my knowledge, some exhibits and museums do not allow food and drink. We had no food or drink with us, I guess it was not allowed either. However in the end of the day MIL rescued us by waiting at the entrance and guiding as to the McDonalds building near the parking lot. Sounds the crowd at there were very slow and not moving. Which is hard if you want to move ahead faster than them. MIL rescued you by ushering you guys to the McDonalds…it sounds like MIL is a fan of McDonalds and fast food. I’ve always thought it’s much harder to take video instead of photos. But with video you get more of a feel of the atmosphere with the moving images. I usually made some holiday movies with the material from our China trips and also our wedding. Holiday movies featuring MIL perhaps. I’m sure you got enough footage to make her the star of a show. Never knew you were a closet videographer, Crazy. An amazing place, a true wonder of the world. But too bad Xi’an is so hot in the summer, and the crowded tourists! Still, I wanna go and see already… this many years in China and I haven’t seen the Terracotta warriors, what’s wrong with me?? My b/f says stinky tofu smells like a homeless person’s body odor. BO aside, did you know that I actually forgot about the terracotta warriors. I feel like the Great Wall gets the attention and the warriors actually used to be on my “list”, but after your description, I think I’ll pass. I visited Xi’an in the coldest time of the winter so the heat didn’t affected me. And… I found the warriors quite disappointing. 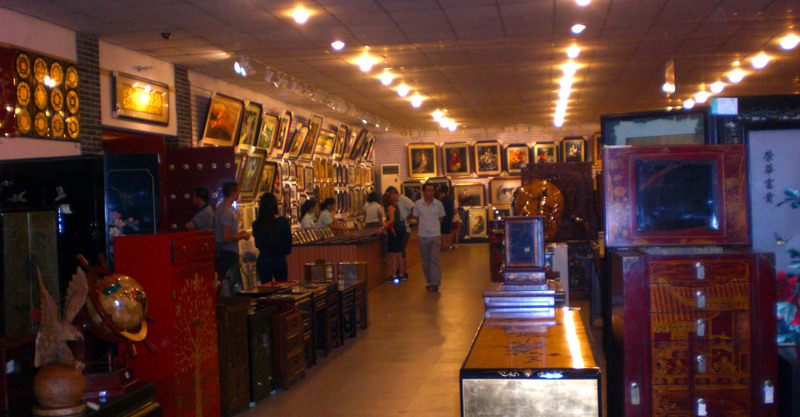 Maybe it is because in Xi’an you can see copies of them everywhere, and then you go and see the real deal and it looks more or less the same… dunno. Disappointing, at least for me. But I loved Xi’an! It is a very charming city. It has so much more apart from the warriors! China really does have countless things to see. I’ve been to China several times, but I never made it to Xi’an. Xi’an just seems so far, I find myself attracted to the major metropolitan cities most of time. Xi’an is pretty much located in the middle which also makes it easiert to reach surrounding “attraction” such as Hua Shan etc. Actually most of my China based friends unanimously agree that the Terracotta Army place is a grossly overrated place and that I should not plan to visit. I’m not even sure if I should heed their advice! I cannot imagine anyone would want their face made onto a replica terracotta warrior. It seems a bit creepy to me. I’m not very good at guided tours (I used to work as a tourist guide/rep when I was younger) as it makes me feel cattle-like, so I always try to see things on my own instead, even if it requires a little more studying. Hooking up with friends who know the places are usually the best way to see all the good stuff and skip the tourist traps:) The furniture looks gorgeous. LOL – your trip to Terracotta Warriors sounded like ours (minus the heat – we were in freezing cold weather instead). A stop at the workshop before hand and then onto the excavation sites themselves. As you probably have read on our blog – we were a little underwhelmed here… maybe one day, we can give it a second chance. I am also thinking whether to give the Warriors another try. Somehow I expetced something more grand due to the millions of things I learned in school, in documentaries and whatnot. I remember my first time visiting the Terracotta Warriors and feeling like it was a dream come true. It was the middle of winter and I was freezing but when I walked into the room, all cold was forgotten. So incredible. Thank you for sharing. I read your post and it took me right back to walking up to the pits in the dreadful heat with that ‘lovely’ stinky tofu – smells disguising I must say. Enjoyed reading your post.